Watermelon is practically synonymous with summer, and there are many ways to slice and dice it (literally!). The refreshing fruit adds sweetness and texture to salads (think grilled shrimp and charred tomatoes) and curry recipes, and it can even be condensed into a cold soup. Watermelon makes for a colorful cocktail, sangria and even a tequila-based cooler. It’s great for a snack or dessert, of course; grill it and serve it with yogurt; create a delectable pudding; or even make popsicles from it. The bright red fruit is in season from mid-June to late August, and there are hundreds of varieties. 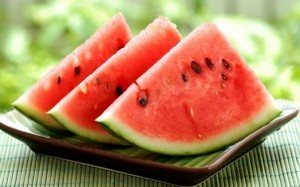 Did you know that the entire melon can be eaten? The rind can be pickled and the seeds can be roasted. When shopping, look for a smooth melon without any bruises and dents. Store it in your refrigerator, and wrap cut melon in saran wrap first.